What is Ionic Window Cleaning? It’s a simple but brilliant idea. A soft-bristled brush cleans the window, while jets of ultra-pure water fed through the brush handle rinses the glass. Because our water is demineralised and free from impurities – the leading cause of spotty or streaky windows – it dries clear. 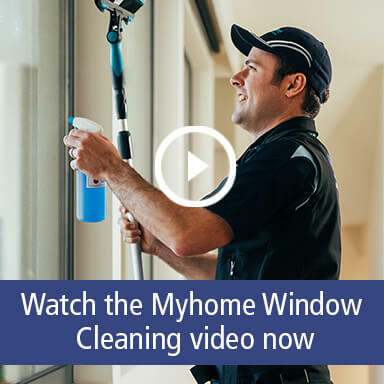 Ionic window cleaning has traditionally been used in workplaces and commercial industries as the most powerful and effective way to clean – Myhome is bringing this advanced technology to residential homes because your home is worth it! That depends. When you request a quote a Myhome representative will get in touch to discuss your requirements and then we will give you a quote. But don’t worry there’s no obligation. You can then have as much time as you want to think about it and get back to us. Once you give us the go-ahead we will schedule in a time to visit you to carry out the clean. It’s easy and convenient. You can pay by credit or debit card (which we treat in the strictest of security and confidentiality at all times) and we debit the amount off your card after the clean has taken place. We can also provide a full invoice for your records. Again that depends. We don’t quote on time, we quote on the job. So, you will pay for the best window clean possible, irrespective of how long it takes. This gives you peace of mind that we won’t be clock watching and also puts the onus back on Myhome to get the job done properly and efficiently. Our interview, training and vetting procedures ensure our staff are all highly dependable, careful, discreet and trustworthy. This is a high priority of ours and one we take very seriously. We have a reputation as one of the best home cleaning services, as such we will do everything within our power to keep it that way. Water-fed poles give our window cleaners the freedom to meticulously clean windows from the safety of the ground, without compromising their safety by using ladders. Because water-fed poles let our window cleaners work safely, in full compliance with occupational health and safety rules, they are able to concentrate on the job at hand to deliver exceptional results. We use specially water-fed poles which can clean windows up to 24.3m (80ft) high. Therefore we can target buildings up to six storeys in height reaching apartment blocks, top story windows and solar panels. Do you clean internal windows and glass as well? Yes, we clean windows and glass both inside and outside your home. Whether it’s windows, glass doors, solar panels, glass roofs, glass balustrades, glass balconies, glass pool fencing or anything else made from glass, we will clean it.